My intro to this flight report still sums up my thoughts best, so I will stick with it. Let’s face it: mention EgyptAir and most instinctively grimace. The carrier does not serve alcohol, does not have cutting-edge seats, and boasts a poor safety reputation. Truthfully, those were my preconceptions too going into my flight from London to Cairo. But in what turned out to be an utter surprise, not only did I find EgyptAir acceptable, I loved it. A lot. Not only was the business class seat more than adequate, but the food and service were fantastic. State-run flag carriers often carry a stigma of indifferent and lazy service. This is not always the case, as acclaimed Singapore Airlines is majority state-owned, and was also not the case on my flight. Service started with a warm smile upon boarding and continued throughout the flight. A cabin crew of five worked the 49-seat business cabin. The crew was professional and good-natured, but also paid attention to detail. Tablecloths were carefully laid and food arranged nicely on serving trays. Drink glasses were not left empty and FAs roamed the cabin throughout the flight to ensure everyone was comfortable. While everyone was great, one FA named Miriam (far right in photo below) went above and beyond. She worked my side of the aisle and was very chatty. Admittedly, I did not expect a gregarious FA on EgyptAir, but loved the conversation about matters mostly concerning EgyptAir. She was very proud to work for her company and the enthusiasm was contagious. I should note here that our flight was delayed by 15 minutes due to a late-arriving inbound aircraft. We still arrived in Cairo on-time. Boarding commenced at 1:45p but did not take long since the plane only appeared about half full (and 1/3 full in business). While I chose to walk, I also note that EgyptAir offers “buggy” (golf cart) service if you are transiting Heathrow. During our taxi I noticed several cool planes like an Air Canada 787, United 757, and South African A330. Most impressive, though, was Concorde. 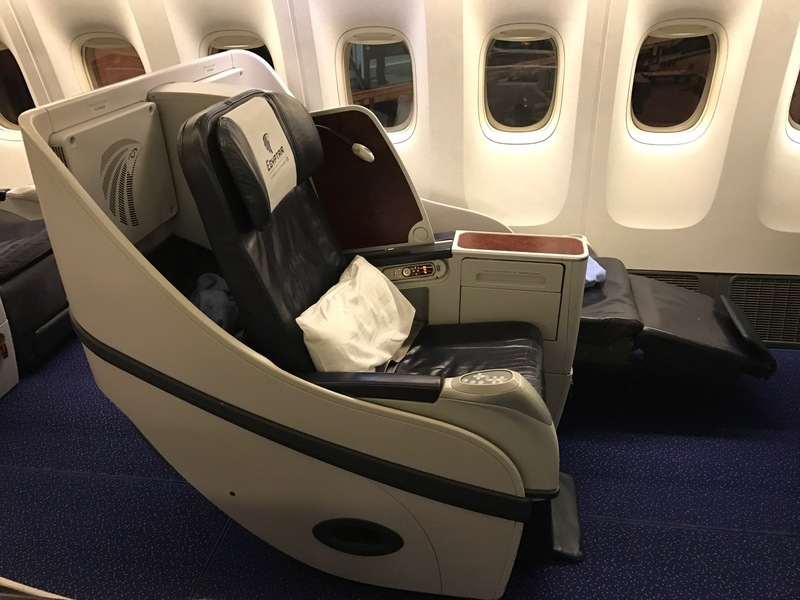 The EgyptAir business class seat is best described as almost flat on the ground, flat in the air. While not a “horizontal lie-flat” bed in the truest sense, the seat does recline to an angled lie-flat mode (flat seat sloped downward). But when the plane is at causing altitude, the angle of the nose means that a truly flat bed is simulated. However you wish to define it, this is the same seat you will find on flights between Toronto/New York and Cairo as well and is comfortable. I enjoyed a nice snooze prior to landing. The cabin is configured in a 2-3-2 layout. 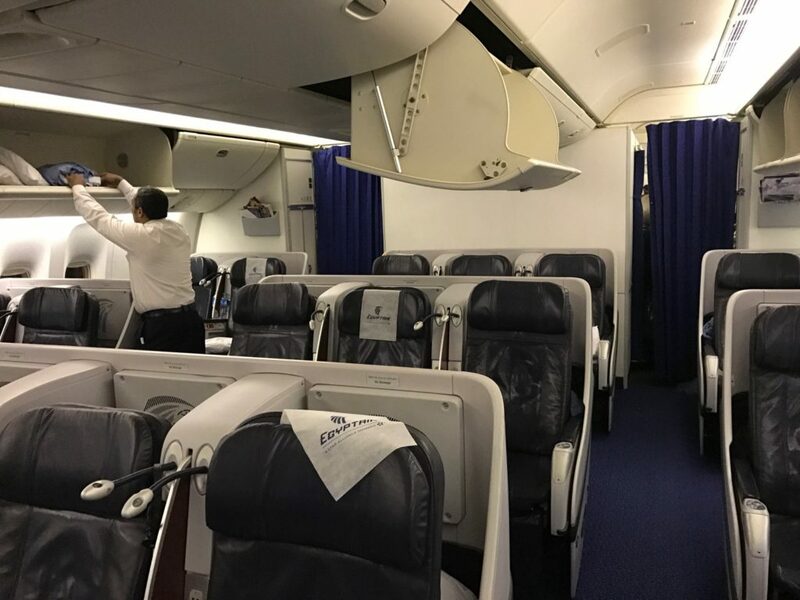 I’d hate to be stuck in a middle seat in business class unless traveling with my wife and son, but the cabin was only half full on my flight. The seat itself has automated controls including a massage function, individual reading light, and a privacy divider that slides out from the center console between seats. Power outlets were available at each seat. No Wi-Fi onboard. The blanket and pillow are frankly more suited for economy class, but did keep my warm. The cabin has no individual air nozzles, yet was cool for the duration of the flight. I noticed prior to takeoff that a DO & CO truck was catering our 777-300. Noting that DO & CO caters for Turkish and Austrian, I knew that was a good sign. Indeed, the menu turned out to be great. A six-course meal on a flight under five hours provided more than enough food. It is puzzling that no local Egyptian dishes were offered — not even Konafa for dessert — but the western-themed menu still proved to be tremendous. Note that EgyptAir is a dry airline. I avoid alcohol when possible when flying in order to avoid jet lag, but keep that in mind. Meal service began immediately after takeoff. First came a plate that contained a salmon appetizer with pine nut, hot bread, a green salad, and a cheese course I saved until after the main meal. Next came the main course, served via trolley cart. I like this method of service (when the aluminum containers are removed) because it allows you to actually see all the main course options. Sometimes menu descriptions are deceiving. I chose the filet mignon mostly because I felt like the au gratin potatoes and sautéed vegetables it came with. But it turned out to be the steak that was best — cooked to medium and brimming with flavor, it was one of the better airline steaks I have enjoyed. Next came a fruit course again served via cart. I asked to try a little of each fruit and the FA cheerfully obliged. Finally, a dessert course–a double chocolate tart that tasted like I was sitting in a Viennese cafe. I cannot vouch for catering out of New York or Toronto, but the catering out of London was great. Even the espresso was great. Water bottles were distributed after the meal service, though FAs were happy to provide any beverage throughout the flight. Note that if you are traveling from New York or Toronto your initial meal service will be very similar. The only difference in service will be a second hot brunch meal prior to landing. IFE movie choices were not as comprehensive as ICE on Emirates or KrisWorld on Singapore, but there were at least a dozen western movies plus TV programming, music and games. Headphones are very cheap and not acceptable for international business class. The amenity kit contained socks, a shoe horn, eye mask, pen, toothbrush, toothpaste, ear plugs, hand creme, a nail file, a comb, and cologne. I mention the lavatory only to note that it was clean even at the end of the flight when I used it. Many instinctively refuse to fly EgyptAir. I hope this review will cause you to reconsider. No, EgyptAir does not have a cutting-edge seat or a nice selection of alcohol onboard. But I did experience great service, good food, a comfortable seat, and would rate my overall flight experience as very satisfactory. I understand why people might choose other options when available, but if EgyptAir is the only option, I’ve seen much worse…I recommend it. Admit it, it doesn’t look bad does it? While the meals look great on an objective basis, I find it terribly disappointing that they offer no Egyptian options at all. Lucky noted the same thing in his review, so I don’t think it was specific to your flight. 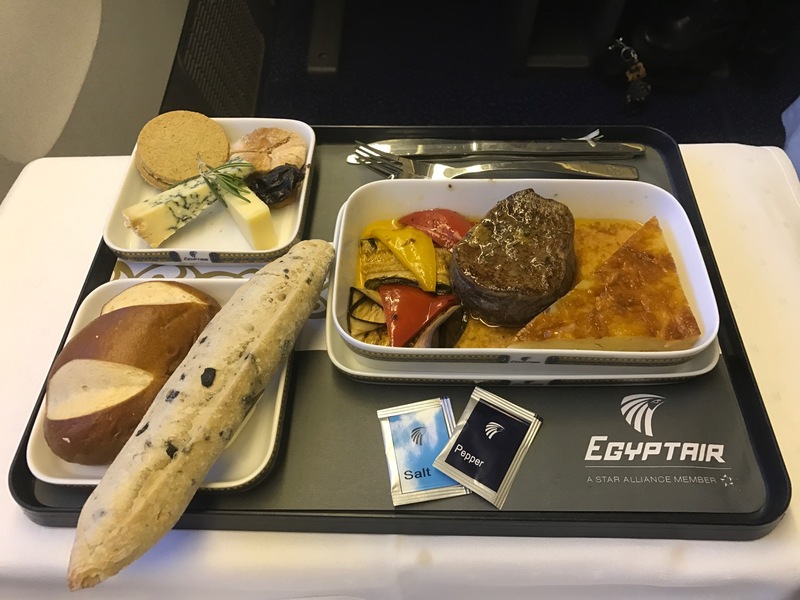 I mean, come on – the flag carrier representing a country with such wonderful cuisine can’t even be bothered to offer a mezze platter? The catering service may ask a supplemental fee to train their cooks to prepare regional cuisine dishes. Herbs and spices may be required that elevate the cost per dish significantly over local selections. Aircraft ovens may not be modern enough to preserve texture and moisture. Keeping Ta’meya crispy could be a project by itself. Without doubt I’d take Egyptair above a few other airlines, most notably Saudi.